Electric Gardens makes its Adelaide debut in 2018 and we thought we would bring our weapon of choice. 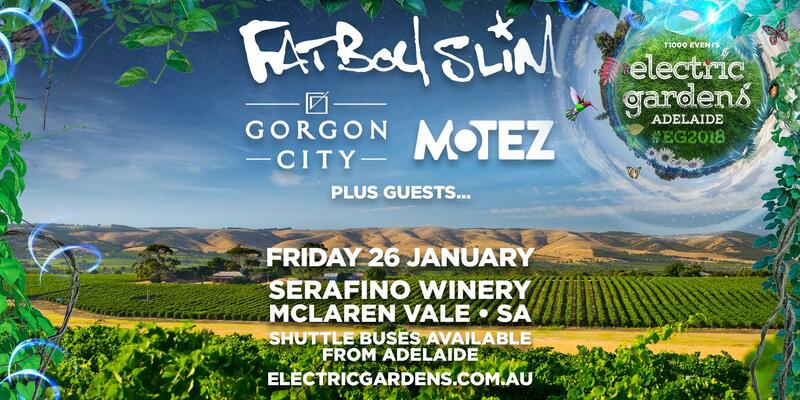 That's right, FATBOY SLIM u2013 one of the most influential artists in the dance music world u2013 will officially headline Electric Gardens Adelaide on January 26, 2018. And the site chosen is nothing short of spectacular u2013 the Serafino Winery in McLaren Vale. After many years away house legend FATBOY SLIM returns! Pulling on his signature Hawaiian shirt once again to be the life and soul of the party. Norman Cook loves being a DJ and it shows in his sets u2013 prepare to witness the greatest party DJ on the planet! Adelaide, you are in for a treat! Supporting Fatboy Slim will be GORGON CITY. Their polished, powerful and party-minded sound responsible for making people cut shapes all over the world. The North London pair have helped shape the trajectory of deep house with their thoughtful, yet infectious productions. We can 't wait to have the North London pair on our EG stage. Special guest added to the bill Motez! Fresh off the back of a US/Canada tour, and a massive Australian tour, Adelaide superstar Motez will be supporting both these heavyweight internationals as our very special guest. Motez has been in high demand following the release of his lauded EP, The Vibe, last year, and his recent single The Future is already an Australian classic. It's hardly surprising this talented South Australian was chosen for main support duties to Disclosure in 2015, and has since been filling clubs all over Australia, North America and Europe.
. .. .. .. .. .. .. .. .. .. .. .. .. .. .. .. .. .. .. .. .. .. .. .. .. .. .. .. .. .. .. .. .. .. .. .. .. .. .. .. .. .. .. .. .. .
and return to Franklin St Bus Station when the event finishes at 10pm.